BACKGROUND: Many studies in multiple sclerosis (MS) have investigated the retina. Little, however, is known about the effect of MS on the cornea, which is innervated by the trigeminal nerve. It is the site of neural-immune interaction with local dendritic cells reacting in response to environmental stimuli. OBJECTIVE: This study aims to investigate the effect of MS on corneal nerve fibres and dendritic cells in the subbasal nerve plexus using in vivo confocal microscopy (IVCM). METHODS: We measured the corneal nerve fibre and dendritic cell density in 26 MS patients and matched healthy controls using a Heidelberg Retina Tomograph with cornea module. 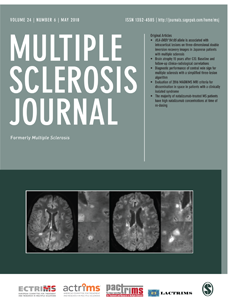 Disease severity was assessed with the Multiple Sclerosis Functional Composite, Expanded Disability Status Scale, visual acuity and retinal optical coherence tomography. RESULTS: We observed significant reduction in total corneal nerve fibre density in MS patients compared to controls. Dendritic cell density was similar in both groups. Reduced total nerve fibre density was associated with worse clinical severity but not with previous clinical trigeminal symptoms, retinal neuro-axonal damage, visual acuity or disease duration. CONCLUSION: Corneal nerve fibre density is a promising new imaging marker for the assessment of disease severity in MS and should be investigated further. Oertel et al. – Optical coherence tomography in neuromyelitis optica spectrum disorders: potential advantages for individualized monitoring of progression and therapy. Neuromyelitis optica spectrum disorders (NMOSD) are mostly relapsing inflammatory disorders of the central nervous system (CNS). Optic neuritis (ON) is the first NMOSD-related clinical event in 55% of the patients, which causes damage to the optic nerve and leads to visual impairment. Retinal optical coherence tomography (OCT) has emerged as a promising method for diagnosis of NMOSD and potential individual monitoring of disease course and severity. OCT not only detects damage to the afferent visual system caused by ON but potentially also NMOSD-specific intraretinal pathology, i.e. astrocytopathy. This article summarizes retinal involvement in NMOSD and reviews OCT methods that could be used now and in the future, for differential diagnosis, for monitoring of disease course, and in clinical trials. BACKGROUND: Gait is often impaired in people with multiple sclerosis (PwMS), but detailed assessment of gait impairment in research and care remains challenging. In a previous pilot study we reported the feasibility of visual perceptive computing (VPC) for gait assessment in PwMS using the Short Maximum Speed Walk (SMSW), which assesses gait on recording distances confined to less than 4 meters. OBJECTIVE: To investigate the equivalence of SMSW to rater-based timed 25ft. walk (T25FW) in a large cohort of PwMS, and to investigate the association of SMSW-derived gait parameters with clinical disability, as well as subjective and objective gait impairment, in order to validate the SMSW as a quick and objective measure of clinical relevance possibly superior to T25FW. METHODS: 95 PwMS and 60 healthy controls (HC) performed the SMSW using a VPC system with Microsoft Kinect. All participants received two immediate retests to establish test-retest-reliability. Both PwMS and HC performed the T25FW. PwMS were rated according to the Expanded Disability Status Scale (EDSS) and answered the 12-item Multiple Sclerosis Walking Scale (MSWS-12) as a measure of self-perceived walking impairment. RESULTS: PwMS showed reduced average speed (p<0.001) and higher mediolateral deviation (p = 0.002) during SMSW than HC. Average speed was the most reliable SMSW parameter in PwMS and HC (intra-class correlation coefficient (ICC) in PwMS = 0.985, and in HC = 0.977). Average speed declined with age in PwMS and HC (r in PwMS = -0.648, and in HC = -0.452, both p<0.001). Correlation of SMSW average speed and T25FW speed was high in both groups (r in PwMS = 0.783, and in HC = 0.747, both p<0.001) and mean difference (0.0013 m/s) between methods was below smallest detectable change. Average speed correlated well with both clinical disability based on EDSS (r = -0.586, p<0.001) and self-perceived walking impairment based on MSWS-12 (r = -0.546, p<0.001). CONCLUSION: VPC-assessed walking parameters during SMSW can reliably detect gait disturbance in PwMS over very short distance. Specifically, maximum gait speed can be obtained with high accuracy in this simple test set-up. Cross-sectional associations with disability and self-perceived walking impairment support clinical relevance. Given its objectivity in a simple test set-up, SMSW is superior to T25FW. Oertel et al. – Retinal ganglion cell loss in neuromyelitis optica: a longitudinal study. Brandt et al. – Frequent retinal ganglion cell damage after acute optic neuritis. Zimmermann et al. – Association of Retinal Ganglion Cell Layer Thickness With Future Disease Activity in Patients With Clinically Isolated Syndrome.